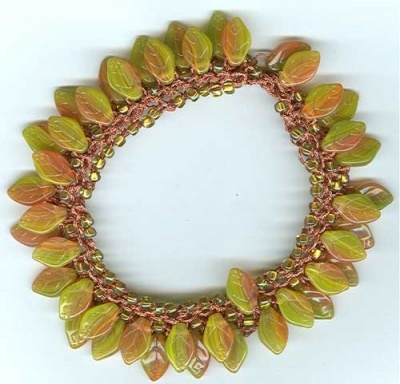 Here is our leaf bracelet, in a knit version. It is easy, it is fast, and looks wonderful (in my oh-so-unbiased-and-humble opinion). 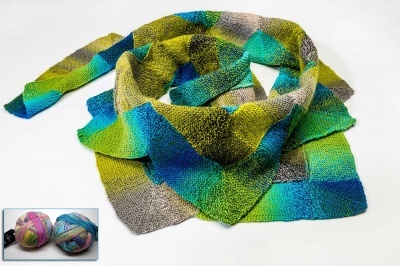 This requires only one spool of any of the metallic threads, less than 50 leaf beads, and 8/0 beads, seed or triangles. The bracelet was originally knit using size 0000 needles. These knitting needles (1.25 mm dps) are no longer on our Needles page -- we can't get them via our supplier any longer -- but we were able to get some excellent quality circular 000's (1.5mm) that will be an excellent substitute if so desired. There are so many options for colors for these kits. If you have specific beads or colors in mind, please choose the "unique personalized kit" option on the drop-down menu below, and let us know what you would like. Otherwise we are going to go with general categories. The Autumnal colors will be golds or browns or oranges or anything that is reminiscent of a Autumn forest. The Summer colors will be brights, be they blues or greens or perhaps even yellows. 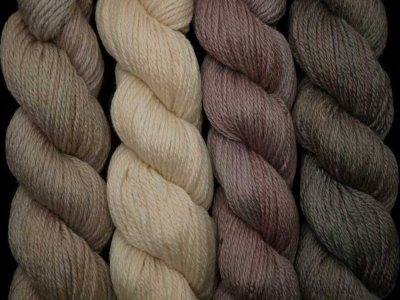 The Spring colors will be softer, more pastel tones, perhaps pinks, perhaps others, but the mix will remind one of the early growths of Spring with its flowers and new grass. And the Winter will be cool tones, sometimes crystal, somtimes silver, sometimes purples or blues or the like, that mirror the cool tones of winter with its bare trees and evergreens and snow and ice and crispness. The kit will give you the choice of getting pattern (or not), the beads, and the thread.